Events being held all day SATURDAY in Downtown St. Johnsbury, including Train Rides, Farmers’ Market, Arts & Crafts Fair, Planetarium Shows, Bluegrass Festival, Parade & much more! Many events FREE or at discounted prices! Visit our cultural attractions, local shops and restaurants. Our community has put together a great event… about 30 organizations and 50 businesses helping to organize this festival! Activities for all ages! 8 am-Noon ALL-YOU-CAN-EAT PANCAKE BREAKFAST, St. Johnsbury House, 1207 Main St. Benefits St. J. Meals on Wheels program. By donation. (Ham, scrambled eggs, beverage and Maple Grove Farms of Vermont pancakes & syrup). 9 -11 am DUX THE BALLOON MAN, outside Eastern & Main Market & Deli, 1194 Main St. Renowned balloon entertainer will be making a large balloon sculpture. FREE. 9 am-2 pm CALEDONIA COUNTY FARMERS’ MARKET, with musical performance, Pearl Street, behind TD Bank. Family Art Activity, led by teaching artist Heidi Lyons, will run from 9 am-1 pm. Open to all. FREE. 10 am-all sold PIE SALE, St. Johnsbury Athenaeum lawn, 1171 Main St., to benefit Friends of the Athenaeum. 10 am PARADE, "What Makes the Northeast Kingdom Special," Main Street/Eastern Ave./Railroad Street. FREE. 10 am-3 pm SHOEBOX RAFFLE, St. Johnsbury Welcome Center porch. Raffle of handmade crafts and items from our vendors. $1/ticket or $5/book of 6. Drawing at 3 pm. 10 am-3 pm BOOK SALE, Secondhand Prose, 1222 Main St., to benefit Friends of the Athenaeum. 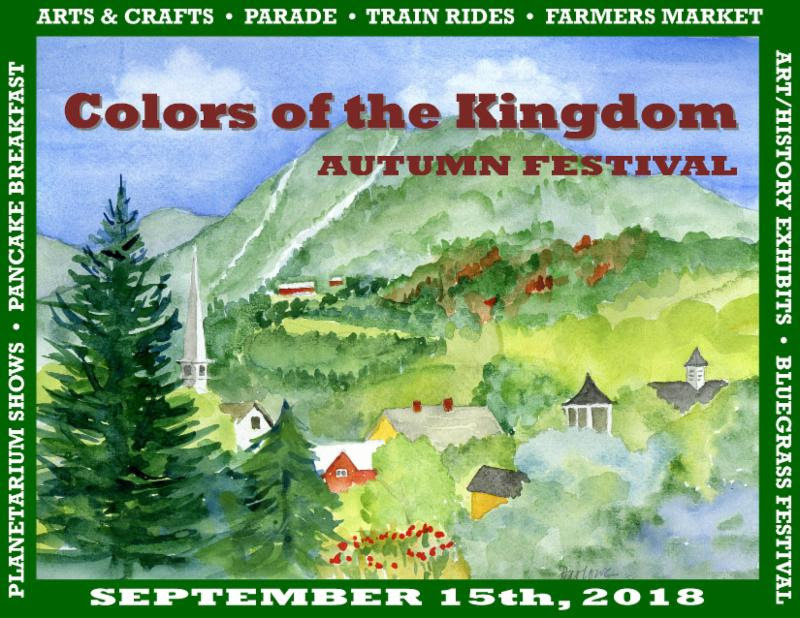 10 am-3:45 pm COLORS OF THE KINGDOM ARTS & CRAFTS FESTIVAL, inside & outside of the St. Johnsbury Welcome Center and on Railroad Street. Handmade crafts, artwork, flea market, goodies and food vendors. COOKIE WALK, St. Johnsbury Welcome Center (inside), hosted by Grace United Methodist Church. Home-made cookies; you choose what you like to fill your tin, and hot coffee sold. 10 am-4 pm ST. JOHNSBURY HISTORY & HERITAGE CENTER, 421 Summer St. Tours offered. By donation. 10 am-5 pm+ DOWNTOWN ST. JOHNSBURY ACTIVITIES, inside & outside of stores on Railroad Street & Eastern Avenue. Downtown activities, sidewalk sales. Shop our stores! Visit our restaurants! 10:30 am-1 pm DROP-IN CRAFT CLASS FOR ALL AGES, Catamount Outback Artspace, 107 Eastern Ave. Make your own leaf person, using real leaves. FREE. 10:30 am-5:30 pm ART EXHIBIT, Northeast Kingdom Artisans Guild, 430 Railroad St. Exhibit in Back Gallery: “New Works by 21 Artists.” FREE. 11:30 am-2:30 pm DUX THE BALLOON MAN, Eastern & Main Market & Deli, 1194 Main St. Balloon animals for kids. FREE. 12:30 pm PLANETARIUM SHOW, Fairbanks Museum & Planetarium, 1302 Main St. Cost $6. PLANETARIUM SHOW, Fairbanks Museum & Planetarium, 1302 Main St. Cost $6. 2ish-4 pm ST. JOHNSBURY DISTILLERY RUM TASTING, 1350 Main St. Must be 21 or older. 2-7 pm 1ST ANNUAL ST. JOHNSBURY BLUEGRASS FESTIVAL, outside Kingdom Taproom, 397 Railroad St. Performers include Mile Twelve, at 2 pm; Maybe April, at 3:45 pm; and Bob Amos & Catamount Crossing, at 5:30 pm. Sponsored by Catamount Arts & Kingdom Taproom. FREE. 9 am-5 pm ST. JOHNSBURY WELCOME CENTER, 51 Depot Square. Volunteer on duty. Throughout the day: train rides, food, arts & crafts fair, flea market, shoe box raffle, cookie walk, and more. Located in and around the center and Railroad Street. 9 am-5 pm FAIRBANKS MUSEUM & PLANETARIUM, 1302 Main St. FREE Museum Admission All Day. Featured exhibits: “The Last of the Hill Farms: Echoes of Vermont’s Past,” featuring the works of Richard W. Brown, photographer. Museum Balcony. For planetarium shows, see other side for times and cost. Also, check out the Shippee Family Eyecare Butterfly House when at the museum! 10 am-3 pm ST. JOHNSBURY ATHENAEUM & ART GALLERY, 1171 Main St. Docent on hand to offer tours of gallery and athenaeum. By donation. Exhibit in Second Floor Gallery, “Rock Water Forms,” photographs of Maine, New Hampshire, New Brunswick & Newfoundland, by Andrew Hepburn. 10 am-4 pm ST. JOHNSBURY HISTORY & HERITAGE CENTER, 421 Summer St. Tours of history center. By donation. 11 am-9 pm CATAMOUNT FILM & ARTS, 115 Eastern Ave. Exhibits: “Uncovered,” Paintings by Gerry Bergstein, in Fried Family Gallery; and Sculptures by Gail Boyajian, in the Rankin Family Gallery. FREE. Varied Times: SPECIALTY SHOPS, RESTAURANTS & BUSINESSES, throughout St. Johnsbury & the region. Stop in to our wonderful establishments to see the treasures they have to offer! Visit the Welcome Center for suggestions for other activities to do and attractions to see while in town and in the area. TD Bank, Price Chopper, Northeast Kingdom Human Services/Northern Counties Health Care, Maple Grove Farms of Vermont, Fairbanks Scales, Murphy Realty, Passumpsic Savings Bank, Community National Bank, St. Johnsbury Auto, Union Bank, Weidmann, the Town of St. Johnsbury, the Caledonian-Record, Vermont Broadcast Associates, Fred’s Energy, Northeast Kingdom Learning Services and Begin Realty.